Today we are welcoming back the gorgeous Creating Creatives!! 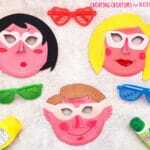 We are a great fan of her work and are so excited to share another fantastic Paper Plate Mask creation with you. 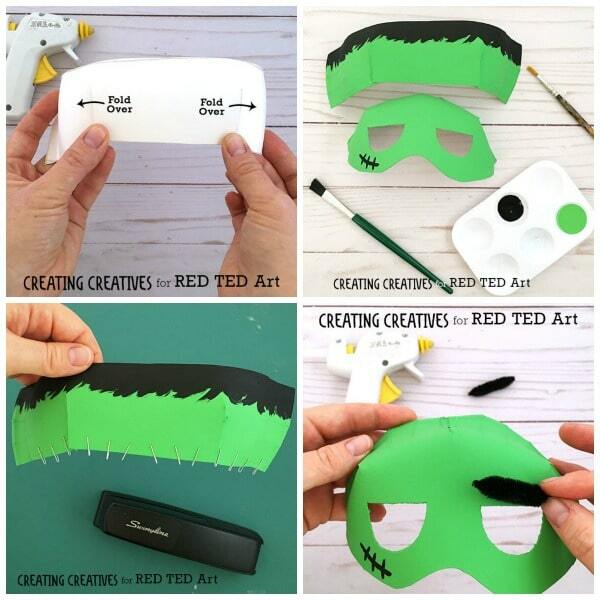 Yep.. it is time for a Paper Plate Frankenstein Mask with Template!! Fantastic. 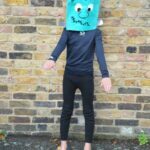 This guy is simply fabulous and makes the perfect No Sew Halloween Costume and a great addition to our collection of Paper Halloween Crafts for Kids. 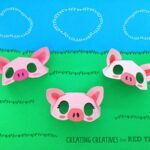 Check out all of Creating Creatives’ Contributions here on Red Ted Art. 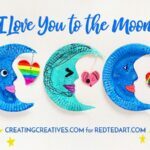 I know you will love them all! Hey there Tedsters! We’re back and with another mask! As Halloween is coming up I thought I’d bring it back old school to good ol’ Frankenstein! 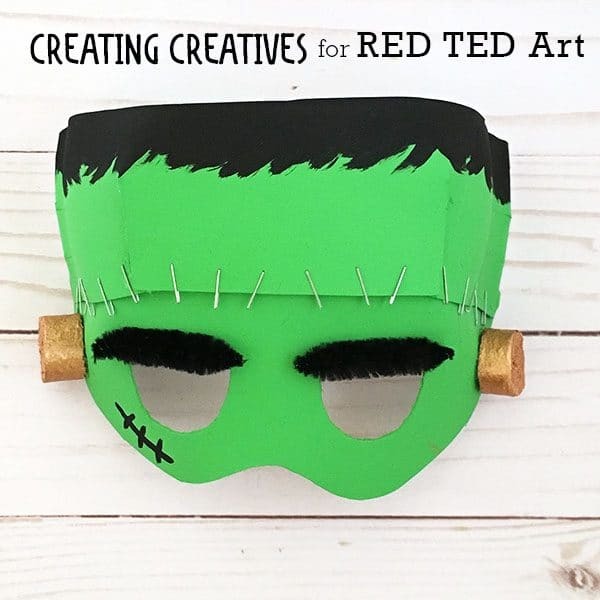 I hope you have a frightfully good time making him and if you do be sure to tag me on Instagram @creatingcreatives, I’d love to see how it turns out! 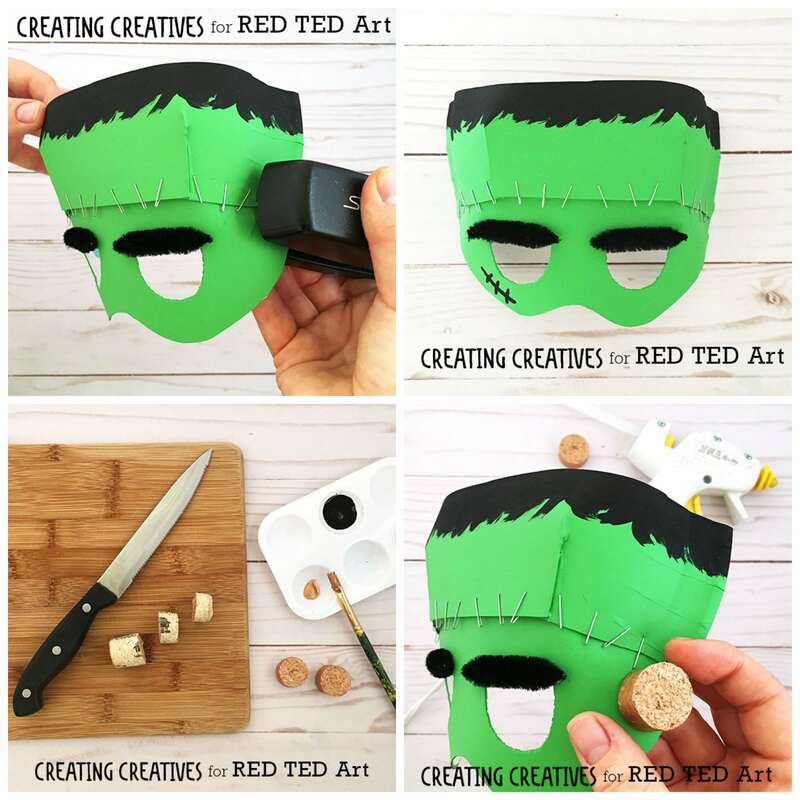 How to make a paper plate mask for Halloween – Frankenstein style! 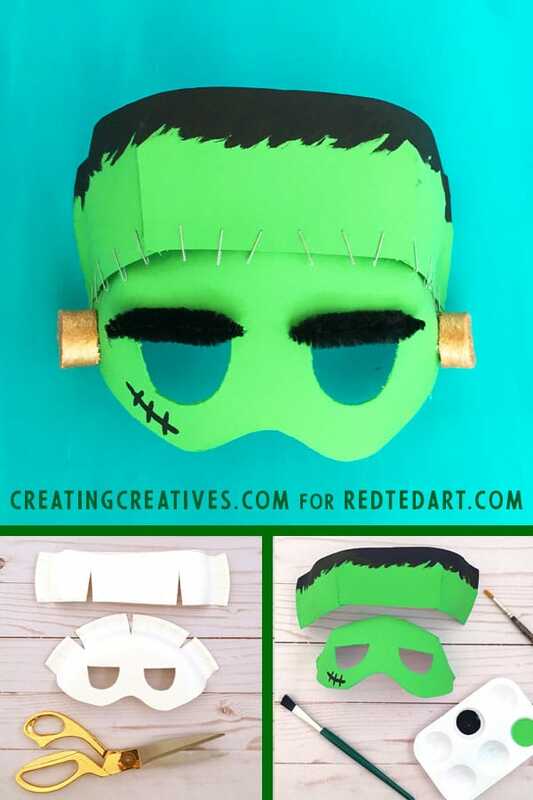 Once you’ve printed and cut out the Frankenstein mask templates, trace them onto the back of a paper plate. 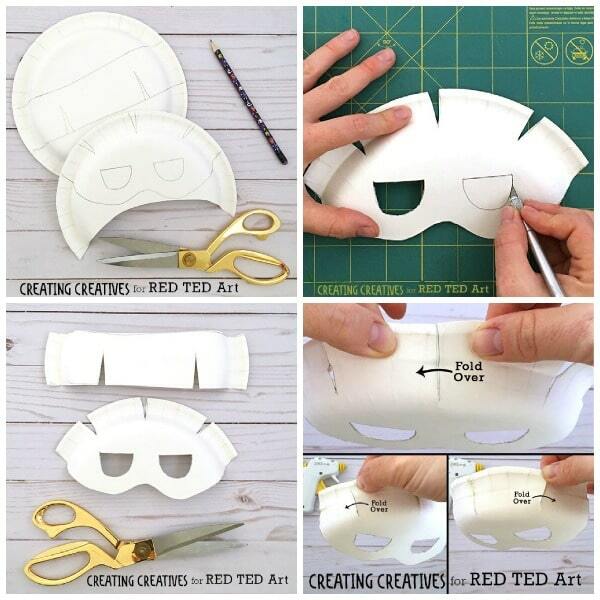 Line up the face part of the mask with the edge of your paper plate to trace. Trace the forehead piece across the middle of a plate. Now to assemble your mask. Start with the center slit of the main mask. Slightly overlap the right side over the left and hot glue together. For the left slit, fold the right side over the left and hot glue together. For the right side slit, take the left side and fold it over the right side and hot glue together. Do the same with the forehead piece, hot gluing together per the picture. It’s painting time! Give both pieces a base coat of green paint. Once dry paint in some hair on the top of the forehead piece and a scar on the face piece. Feel free to paint on any other details you want! Take your stapler and add staples across the bottom of Frankenstein’s forehead leaving half the staple hanging off. Cut a piece of bump chenille or pipe cleaner and hot glue on for the eye brows. If you play with the angle of the eyebrows you can play with the emotion of Frankie, angling them up a bit makes him look more confused, having them go straight across makes him look meaner. If you don’t have any chenille you can always paint them in. Staple the forehead onto the face mask with one staple on the right, and one staple on the left of the mask. Using a knife or craft knife, cutting board and adult supervision, cut 2 pieces of cork and paint a metallic color to use for the bolts on Frankenstein’s head. Hot glue them onto each side of the mask. Finally, punch a hole on either side of the mask and thread through some elastic, string, or even pipe cleaner. You’re done! 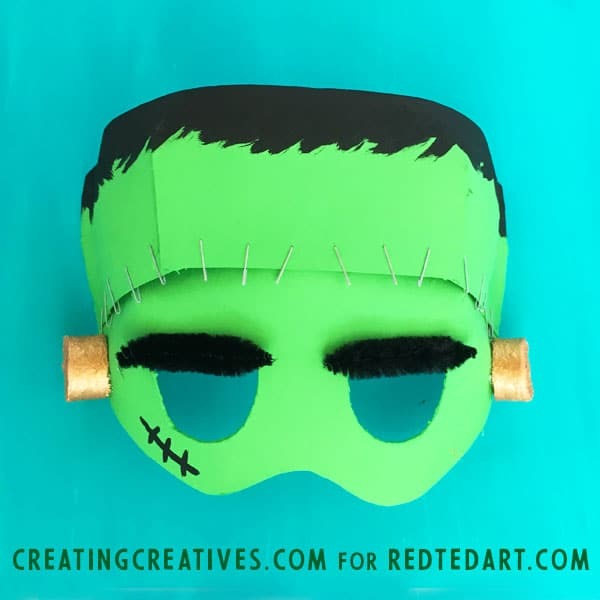 Isn’t this the most clever Frankenstein Mask Template EVER? Just spectacular! More ingenius ideas by the wonderful Creating Creatives!! 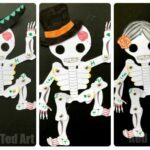 More fantastic Halloween Paper Crafts for Kids! 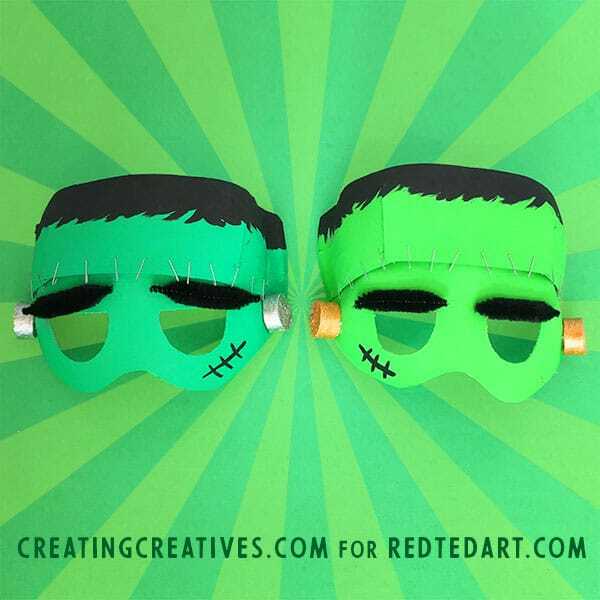 This is really a cute Frankenstein Mask! Halloween is coming up and this will be perfect for a Halloween costume. 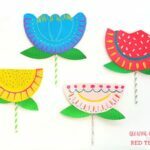 It will be more special if parent and their child will make this craft together. It would be a good way to bond also. 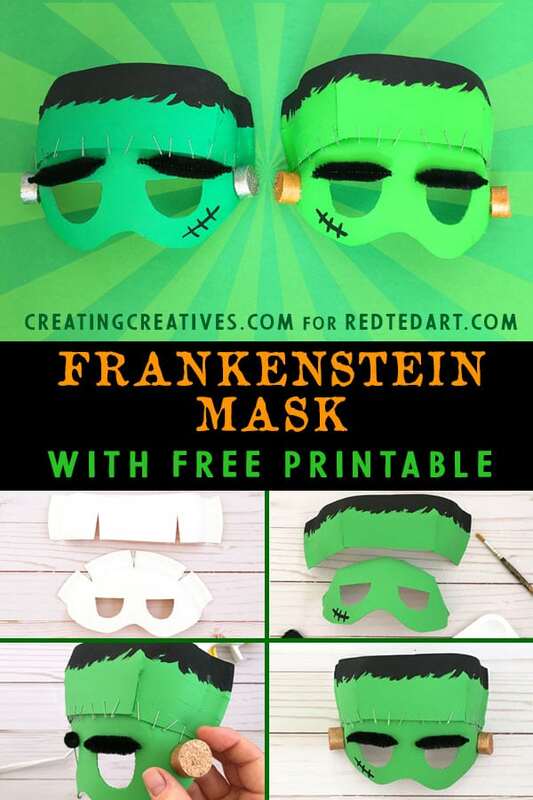 This is a great idea to make Frankenstein Mask for Halloween. For my child and her friends, I will make it. This is easy and cost effective, also, creative. My child will love this very much. And definitely I will tag you on Instagram. Brilliant! Look forward to seeing them! 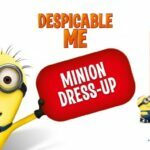 Halloween is coming, great idea for my son! hahaha. Thanks for sharing! The hulk mask looks way too cute for Halloween! 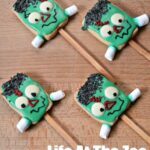 Nonetheless I’ll make this with my son for this year’s trick and treat! Enjoy!! 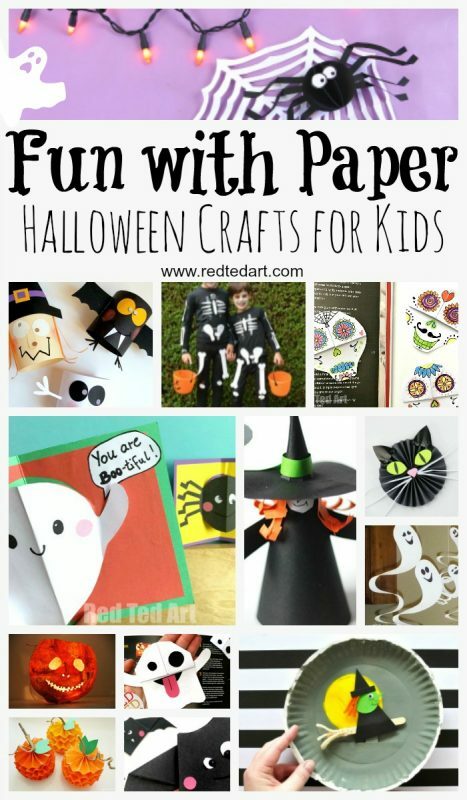 We do love “Cute” Halloween ideas!